From its evergreen-topped rockbound coastline shrouded in fog to its great title rivers, Maine has attracted sailors for centuries. Pain takes his readers from shipbuildings meager beginnings in the early 17th century to the battleships fishing and lobster boats of today. Historic photographs and prints of paintings help to illustrate Maines long-time relationship with the sea. Sawing plank was a laborious process. A pet was dog and a staging setup across it, the log was levered out on the staging and sawn by the use of a long two-man handsaw... one man stood in the staging, astraddle the log and facing opposite to the direction of the saw cut. The man in the pit faced the direction of the saw cut, to avoid sawdust, and by alternately pulling on the saw, the man could rip a log into a plank. The work was slow and required so much work that the "sawyer" became a recognized trade. Easily read in an evening or two, Down East deserves to become part of every sailor or would be sailors library. 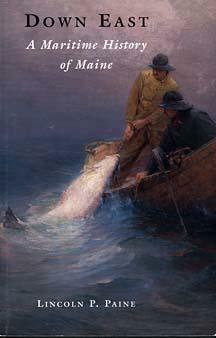 Clearly written and lacking the pretension found in some Maine resorts, its a book for everyone who loves the sea. Maine attracts visitors because of its rich maritime history. For Paine the maritime images of Maine are part of everyday life. But for many visitors, these images need to be conjured up and savored from time to time. Paine describes the logs driven down to the Penobscot River to be milled for shipbuilding and export. He devotes an entire chapter to coastal schooners, the big rigs of the maritime world during the last half of the 19th-century. Carrying coral, granite, lumber, lime and other goods, they helped build the economy of towns along the East Coast. Maine fosters a conservative nostalgia for tradition and Paines history carries that well into the 21st century. He has created a navigational guide to help his readers make their way through centuries of maritime fortitude and self-reliance. Lovers of Maine and all things to do with the sea will cherish Lincoln Paines book Down East.